Whether it’s for occasional use in your barn or you’re a riding school with lots of horses and eager learners, when you’re searching for a high quality, strong tack hook then look no further than our massive range at Rope Services Direct today. Tack hooks can have many uses but are typically created to hang up and store the pieces of tack you use for your horse or pony. They’re perfect for use with a horse box, farm or stables to keep your bridle, martingale and other hanging items together. After all, they’re expensive pieces of kit and deserve to be looked after! 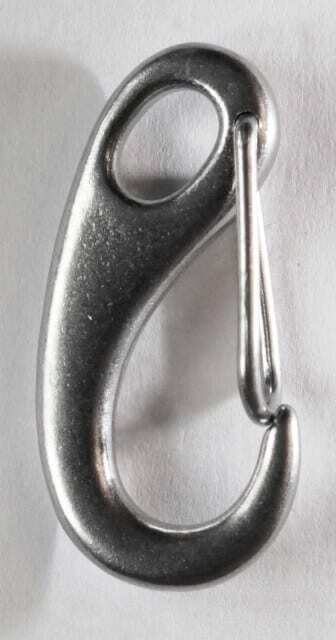 Made from tough stainless steel, these very durable tack hooks are wallet-friendly and simple to screw in. They’re rust-proof too, even in harsh outdoor elements. Not only are they ideal for any keen horse rider, but they’re also handy in other leisure activities like sailing and water sports. Not quite sure if it’s a tack hook you need? You’re not alone! If this sounds like you, it might well be worth exploring our snap hooks, eye bolts and lifting shackles too. Offering a phenomenal spectrum of tack hooks to look through, Rope Services Direct can save you a real headache – and money too! To place your order, all you need to do is fill out our e-form here. If you want to run an idea past us or have a burning question you need our help with, feel free to give us a call on 01384 78004 today. Tack Hook Overall rating: 5 out of 5 based on 6 reviews.